Super duper awesome TAD is here and is ready to shine!! 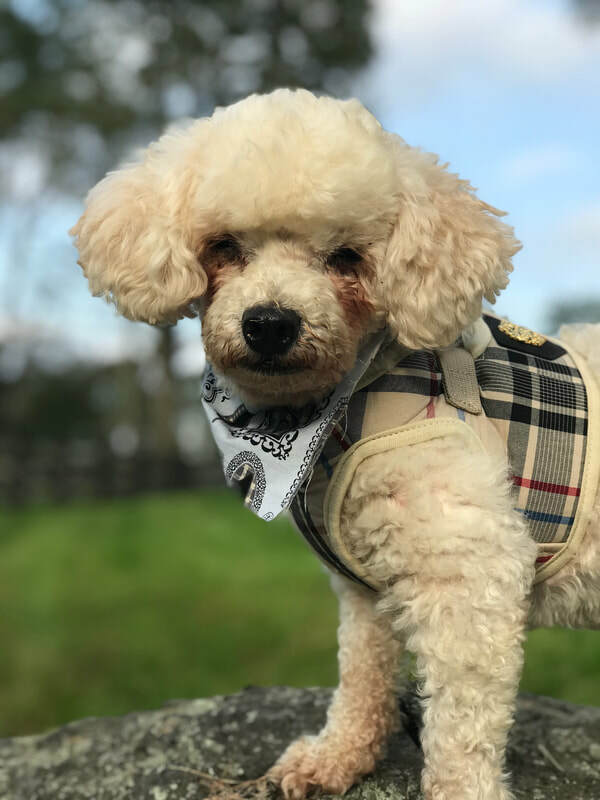 TAD (yes we spell his name is all caps because he is THAT awesome) is a 10+ year old senior toy poodle that was abandoned at an animal shelter in South Carolina. This boy has the brightest and most joyful, kind spirit.. he is very light on his feet and on walks he blissfully prances along. He is most often side by side with his "littles" friends. He does this adorable move where, as they're walking, he'll bop one of the dogs next to him with his nose and pop forward as if to say "Hey! How great is this walk?! I'm so happy to be here next to you! What fun!" TAD is so well mannered and because of his stable personality we were able to bring him to a few of our events this past week. Kids, dogs and lots of people all around and TAD never wavered.. he is solid to the ground and very confident in his own skin. He happily greeted each person and hung out next to them, and even on a few laps while they swooned over his sweetness. Mr. TAD spends his days at the rescue going on long walks with his buddies Chip, Piper, Bodhi and Alvin, playgroups in the big grassy yard or hanging out on someone's lap in the office. When it comes to meal time, he really gets excited and will let out these funny little barks that almost sound like a horn tooting as he impatiently waits to be served! Even though he is older in age and losing some hearing and sight, TAD is very active and fresh. He loves outdoor activities and will certainly not be content with being an indoor dog that doesn't get out much. TAD would be the perfect companion for many household types that will enjoy having a little bright light in the form of TAD in their home!